Accent instruments are an exclusive brand to brick and mortar stores. If you are interested in giving one a try, stop in at any of our stores and we will be happy to help you out! 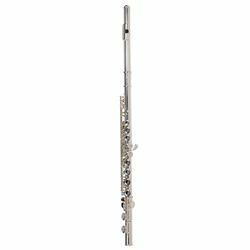 C Flute; closed-hole model with C-foot; ideal for the beginning flutist. Silver-plated head, body, foot and keys give an outstanding appearance and a very solid feel under the fingers. Offset G key offers easier reach for beginning players, as the ring finger on the left hand can reach the G key more easily in this configuration. Rolled tone holes for longer pad life, easier maintenance, and faster response. Ribbed construction keeps the body more rigid and less likely to need adjustment. Includes a sturdy case for protection of the flute inside.